A life full of great promise has been cut short by the death in France of Lieut. Wilfred B. Clarkson. He was associated all his life with the Primitive Methodist Church at Rawmarsh. He was Sunday school superintendent, choirmaster, and a very promising local preacher. 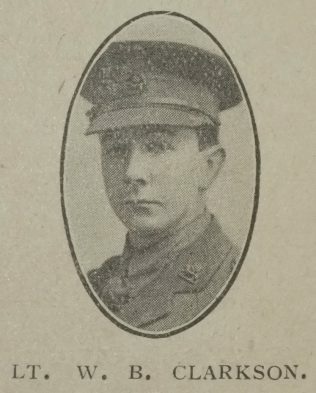 He was wounded and gassed in August of last year, and after recovery was made bombing officer, and was sent into the tranches, where he contracted pneumonia, and passed away on June 20th, 1918. A beautiful memorial service was held on June 30th, when a large number of friends assembled. The service was conducted by Rev. E.J. Hancox. Wilfred was Temp 2/Lieutenant in the York and Lancaster Regiment, 2nd Battalion. He was formerly Private 28319 in the same regiment. Wilfred worked as a bank clerk before the war.